The Mass is, in cultural terms, the greatest artifact that the Church possesses. Within the Tridentine Mass was expressed repeatedly and with profound reverence the key Teachings of the Church. It fostered a culture that had the strength to face the Wolves. 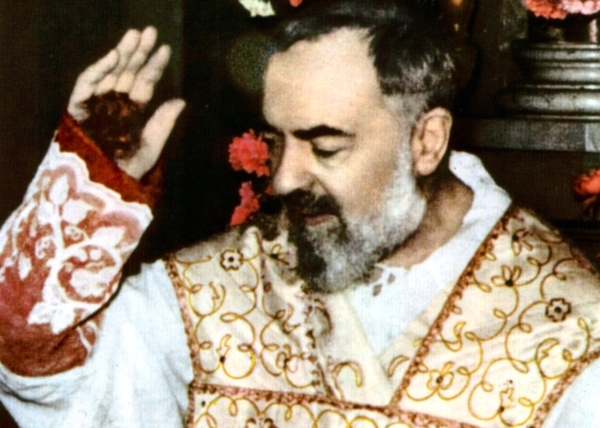 Read about the special martyrdom suffered by Padre Pio through his stigmata, as well as what it was like to attend his Mass. 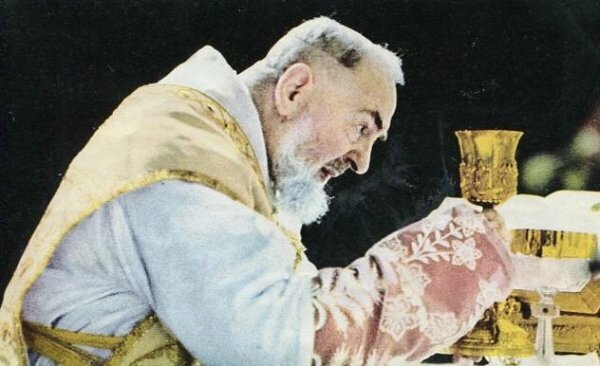 When we consider the life of the saintly Padre Pio, we think of him mostly as a great stigmatist whose essential mission was to suffer and hear confessions, a 20th century Italian version of St. John Vianney. 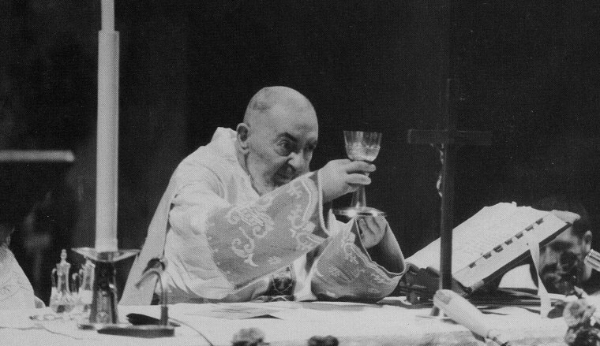 Yet, another aspect was central in his life, the Holy Mass. Fr. Pio’s particular form of martyrdom began very early in his religious life as a Capuchin friar, when in 1918, the appearance of his stigmata raised a few doubtful eyebrows among his superiors. The persecution that followed resulted in his exile at the friary in Campobasso (Italy), where he was forbidden any public ministry. Dear Father, I am dying of pain because of the wounds and the resulting embarrassment I feel deep in my soul. I am afraid I shall bleed to death if the Lord does not hear my heartfelt supplication to relieve me of this condition. Will Jesus, who is so good, grant me this grace? Will he at least free me from the embarrassment caused by these outward signs? I will raise my voice and will not stop imploring him until in his mercy he takes away, not the wound or the pain, which is impossible since I wish to be inebriated with pain, but these outward signs which cause me such embarrassment and unbearable humiliation. 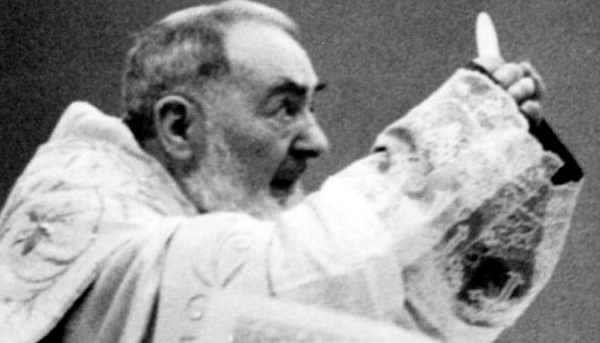 Christ did not accede to the request that his stigmata would disappear (at least not until just before his death), though in 1933 Pope Pius XI ended Padre Pio’s exile upon discovering he had been “badly informed” about him. Thus the faithful son of St. Francis returned to the friary of San Giovanni Rotondo, where he once again heard confessions, and perhaps more famously, celebrated the Holy Sacrifice of the Mass in a profoundly pious manner [see the image gallery below]. 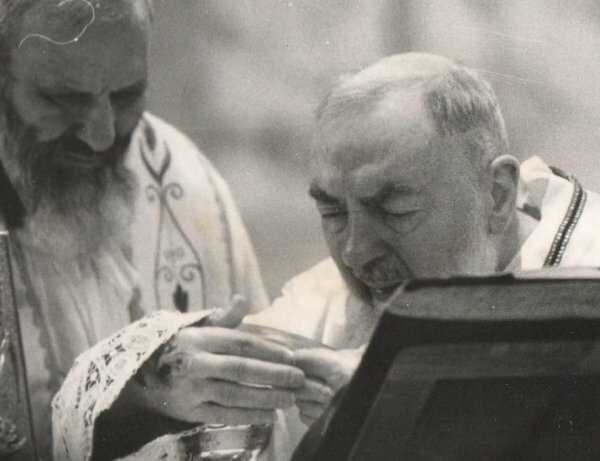 For us today, Padre Pio continues to offer an unsurpassed recent example of a priest fathoming the sacredness of the Divine Action. As the excerpts below from Fra Modestino Fucci demonstrate, his daily Mass was a going to Calvary. 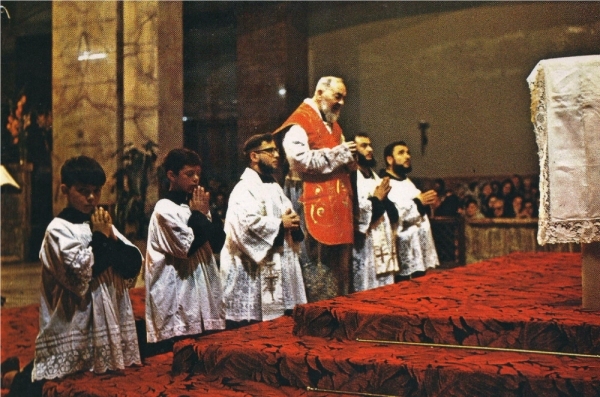 Before presenting the extract, we must note that Padre Pio’s devotion to the Mass was enabled through the traditional Missale Romanum. 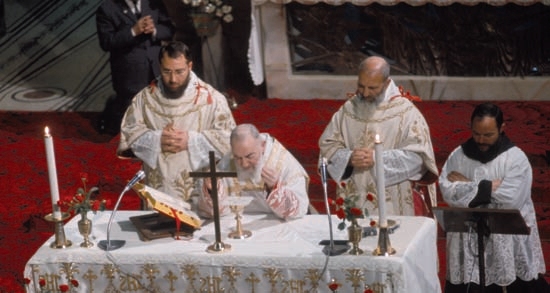 In fact, when the pending publication of the ecumenical Novus Ordo Missae was announced (due in April 1969), he obtained Pope Paul VI’s permission to continue using the Mass of All Time. 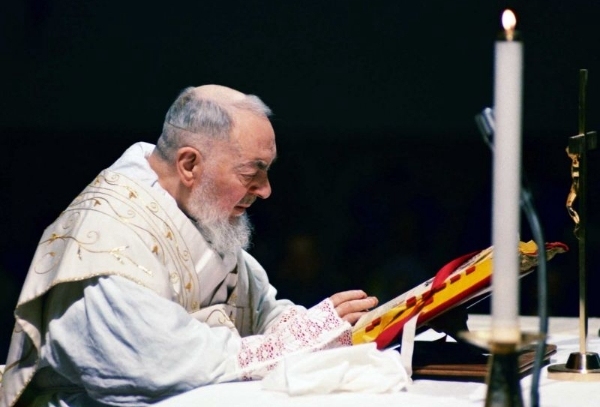 Padre Pio passed to his eternal reward on September 22, 1968, faithful to the Mass of his priestly ordination and as a living representation of alter Christus. He was totally absorbed and conscious of what he was about to fulfill. His face which was of normal color became frighteningly pale when he put on the amice. From that moment onwards he paid no more attention to anyone. Clothed in the sacred vestments he made his way to the altar. Even though I walked ahead of him, I was aware that his gait became more dragging, his face sorrowful. He seemed to stoop always more, as if, I thought, crushed beneath the weight of a gigantic invisible cross. Once he arrived at the altar he kissed it lovingly and his pale face became inflamed. His cheeks would become crimson, his skin translucent so that one almost saw the flow of blood that rushed to his cheeks. After the Confiteor, he beat his breast with hollow and heavy blows as if accusing himself of all the worst sins committed by man. His eyes remained closed without being able to prevent large tears that disappeared into his thick beard. At the Gospel, as he announced the Word of God, it seemed as if he fed himself with these words, tasting their infinite sweetness. 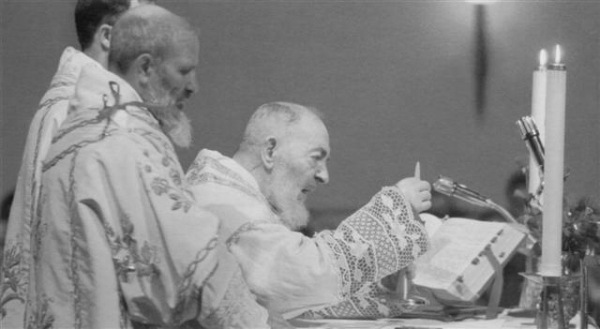 Immediately after, the colloquy between Padre Pio and the Eternal began, and he wept abundant tears. He who had received the gift of contemplation from the Lord was penetrating into the depth of the Redemption. The veils of that mystery having been torn by the suffering of his faith and love, all things human disappeared from his sight. Before his gaze was God alone! Everyone saw Padre Pio suffering. He pronounced the liturgical prayers with difficulty and interrupted by sobs. The Padre felt embarrassment at being watched by the curious eye. 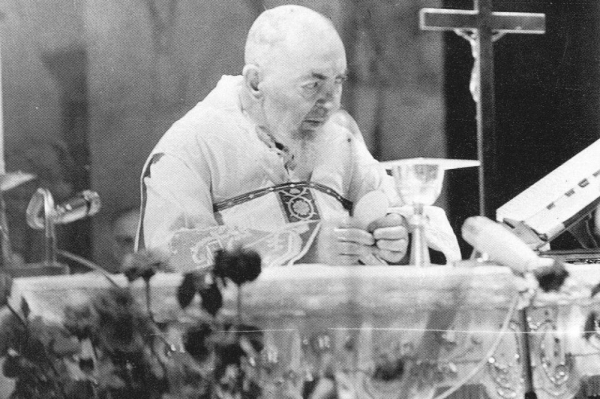 He would have preferred to celebrate Mass privately so as to be able to give free rein to his suffering and to his indescribable love. 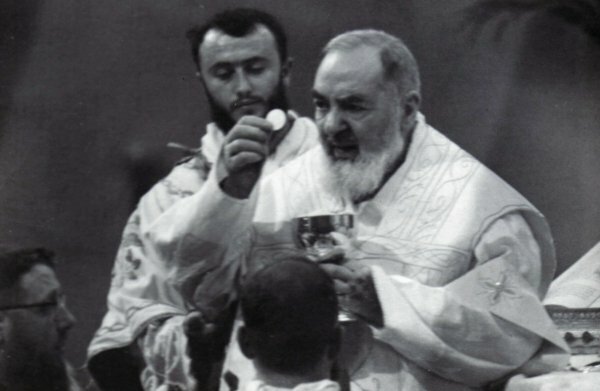 In those moments Padre Pio lived sensibly and really the Passion of the Lord. He was outside time! That was why his Mass lasted an hour and a half or probably more. At the Elevation his suffering reached its height. Watching his weeping, his sobbing, I was afraid his heart would burst, that he was about to faint from one moment to the next. God's Spirit had by now penetrated his whole body. His soul was buried in God. He offered himself with Christ, victim for his brothers in exile. His heart must have burned like a volcano. He prayed intensely for his spiritual children, for the sick, and for those who had already left this world. I heard him repeat often through his tears: "My God! My God!" A spectacle of faith, love, suffering and emotion that reached the point of drama when the Padre raised the Host. The sleeves of the surplice came down and his torn, bleeding hands were in the sight of all, whereas his gaze was on God! At Communion he seemed to relax. Transfigured in a passionate, ecstatic abandon, he fed on the Flesh and Blood of Jesus. How much love emanated from his face! The people, astounded, could not but kneel before that mystical agony, to that total annihilation of himself. The incorporation, the assimilation, the fusion was total! 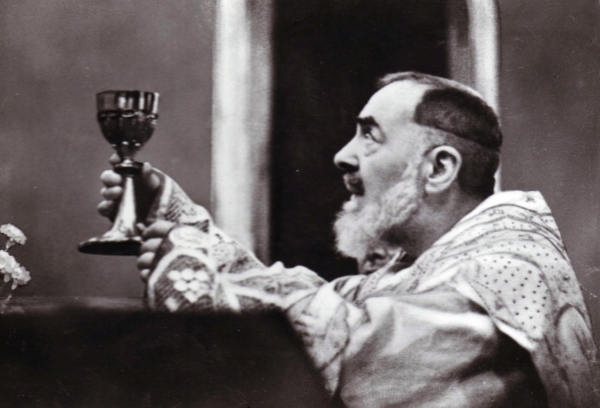 Padre Pio would remain as if stunned as he tasted all the divine sweetness that only Jesus in the Eucharist knows how to give. So the sacrifice of the Mass would be completed with a real participation of love, of suffering and blood. And it brought about many conversions. At the end of the Mass another suffering would devour him—that of going to the choir loft to remain alone and in silence, recollected in prayer to be able to thank Jesus. He would remain immobile as if without life, so absorbed was he in divine contemplation. The Mass of Padre Pio! No one will be able to describe it. Only one who has had the privilege of living it can understand. 1 Fr. Modestino (1917-2011) was a lay brother who resided with Padre Pio at San Giovanni Rotondo for several years. His words on serving Mass for the saintly priest are extracted from The Voice of Padre Pio (periodical of the Capuchins at San Giovanni Rotondo), “Witness to the Padre”, pp 19-20.